As you pack for your upcoming flight, take a moment to think about what would happen if your baggage were lost. Could you survive with only the contents of your carry-on bag for a few days? Rethinking your packing techniques can minimize the impact of baggage loss or delay. Some travelers pack an entire extra outfit in their carry-on bag. For many senior travelers, this might not be possible, because medications, toiletries, valuables, cameras, eyeglasses, and electronics take up a great deal of carry-on space. At a minimum, pack a change of underwear and socks in your carry-on bag. If possible, add sleepwear and an extra shirt. Wear your jacket onto the plane so you have room left for other items in your carry-on bag. You can always take the jacket off once you are on the airplane. If you are traveling with someone else, split up your clothing and shoes so each person's suitcase contains some of the other traveler's items. This way, if one bag is lost, both travelers will have at least one or two outfits to wear. If you are traveling solo, you may want to investigate shipping some items ahead by DHL, FedEx or another freight company to your cruise ship or hotel, depending on the cost of this service, in case your luggage gets lost. As you pack liquids and breakables, consider first whether you really need to pack them in your checked baggage. Could you repackage shampoo into smaller bottles and keep them in your carry-on bag? Could you send that fragile gift ahead instead of bringing it with you? If you really need to pack these items in your checked baggage, think not only about the flight itself but also what would happen if your suitcase were lost. Then, pack accordingly. Wrap breakables in bubble wrap, towels or clothing. Box fragile items for even more protection. Pack liquids in at least two layers of sealable plastic bags. Pack colored liquids even more carefully; consider wrapping the plastic-bagged container in a terrycloth towel, which will help absorb any liquid that might escape the plastic bags. If you are packing liquids which could stain, such as red wine, also place your clothing and other items in a separate plastic bag. (Tip: Plastic-bag your clothing if you know the weather at your transfer or destination airport will be rainy, too. The best way to prevent theft is to carry all of your medications, travel papers, valuables, and electronics with you. Do not put them into your checked baggage, even if you secure your suitcase with a TSA-approved lock. Before you travel, make a list of all the items (or at least the expensive ones) you will pack. Take photos of your packed suitcase, inside and out, to document your belongings and to show what your luggage looks like. If you have to file a lost luggage report, you will be very glad you have your list and photographs. 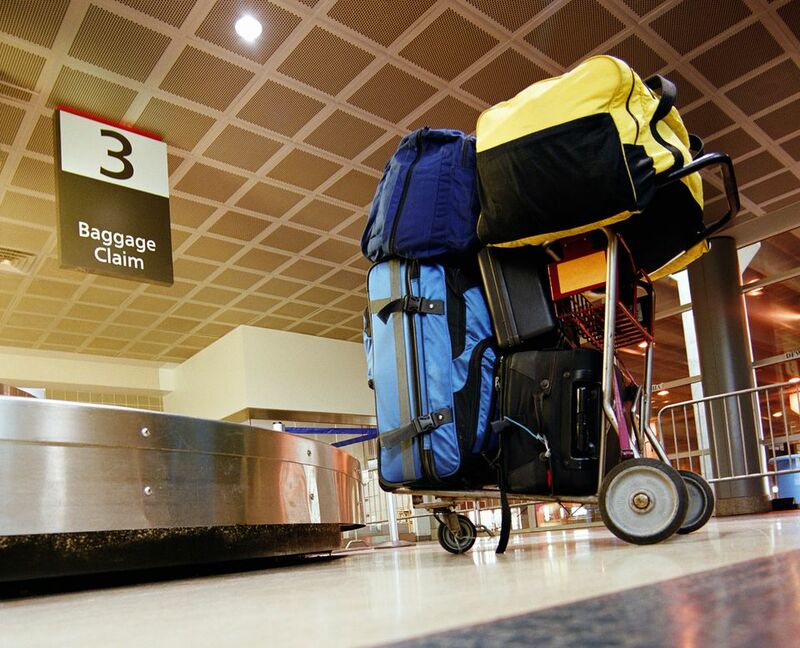 Help your airline return lost luggage to you by including your destination address and a local or (working) mobile telephone number on an outside luggage tag and on a piece of paper taped to the inside of each bag you check. Luggage tags, while helpful, sometimes get torn off suitcases, leaving airline personnel wondering where to send baggage that has gone astray. As a safety precaution, do not put your home address on your luggage tag. Thieves have been known to break into homes after learning via luggage tags that specific houses were probably unoccupied. Use another local address, such as an office, to tag your bags for your return trip. During the airport check-in process, make sure your luggage is properly tagged and barcoded with the three-letter code of the airport you are flying to. Errors are easily fixed if you notice them before you leave the check-in counter.